Edwin Ríos does not have any MLB stats for the season. Draft: 2015, Los Angeles Dodgers, 6th rd. Edwin Gabriel Rios…resides in Kissimmee, FL…graduated from Osceola (FL) High School, where he was named team MVP and all-county during his senior year, hitting .400 with four home runs and 30 RBI…played three seasons at FIU, where he was named first team All-Conference USA and First-Team ABCA South Central All-Region honors in 2015 and second team Freshman All-American by the National Collegiate Baseball Writers Association in 2013...as a junior he slugged 18 home runs, which was the fourth-most home runs in a season in school history…selected in the sixth round of the 2015 First-Year Player Draft and signed by scout Adrian Casanova. Played 88 games for Triple-A Oklahoma City, slashing .304/.355/.482 with 25 doubles, 10 home runs and 55 RBI…made his season debut on May 25 after opening the campaign on the DL ... Hit .366 (34-for-93) with runners in scoring position ... Defensively, appeared in 28 games at first base, 38 games at third base and 17 in left field. Split the season between Double-A Tulsa and Triple-A Oklahoma City, slashing .309/.362/.533 with 34 doubles, 24 homers and 91 RBI in 128 combined games ... With runners on base he recorded a combined .335 average, while posting a .331 mark with runners in scoring position…excelled against right-handed pitchers batting .324, compared to a .259 mark against lefties ... Started the season with Tulsa and was selected as Baseball America's Double-A All-Star, along with being named Texas League mid-season All-Star, after hitting .317 with 21 doubles, 15 homers and 62 RBI in 77 games…also selected as the league's Player of the Week for the period ending April 30 ... Ranked among the Texas League leaders in batting average (3rd), runs (47, 7th), hits (97, T-1st), extra-base hits (36, 1st), doubles (T-2nd), home runs (T-2nd), RBI (2nd), SLG (.533, 1st) and OPS (.891, 1st) prior to his promotion to Triple-A OKC on July 7. Named the 2016 Dodgers' Branch Rickey Minor League Player of the Year after posting a .301/.341/.567 slashline, with 26 doubles, 27 home runs, and 76 RBI in 108 combined games with Single-A Great Lakes, Single-A Rancho Cucamonga and Double-A Tulsa ... Opened the season with Single-A Great Lakes, where he hit .252 with 17 runs, eight doubles, a triple, six home runs and 13 RBI in 33 games for the Loons ... Promoted to Single-A Rancho Cucamonga on June 4 and during his 42-game stint with the Quakes, he led the California League in batting average (.367), hits (65), home runs (16), RBI (46), extra-base hits (28), total bases (126) and OPS (1.105) from June 5-July 27 ... Reached Double-A Tulsa on July 28, where hit .252 with 14 runs, six doubles, five home runs and 16 RBI in 29 games for the Drillers ... Selected as a MiLB.com Organization All-Star. Appeared in 22 combined games with the Rookie-level AZL Dodgers and the Rookie-advanced Ogden Raptors in his first professional season, combining to hit .253 with three homers and 13 RBI. 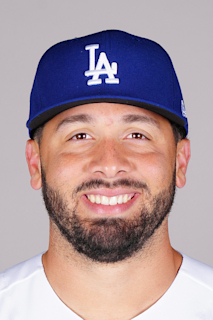 March 11, 2019 Los Angeles Dodgers optioned 3B Edwin Rios to Oklahoma City Dodgers. March 11, 2019 Los Angeles Dodgers reassigned 3B Edwin Rios to the minor leagues. November 20, 2018 Los Angeles Dodgers selected the contract of Edwin Rios from Oklahoma City Dodgers. January 30, 2018 Los Angeles Dodgers invited non-roster 1B Edwin Rios to spring training. July 7, 2017 1B Edwin Rios assigned to Oklahoma City Dodgers from Tulsa Drillers. February 28, 2017 3B Edwin Rios assigned to Los Angeles Dodgers. July 28, 2016 3B Edwin Rios assigned to Tulsa Drillers from Rancho Cucamonga Quakes. June 4, 2016 1B Edwin Rios assigned to Rancho Cucamonga Quakes from Great Lakes Loons. April 22, 2016 1B Edwin Rios assigned to Great Lakes Loons from Ogden Raptors. October 30, 2015 1B Edwin Rios assigned to Cangrejeros de Santurce. July 24, 2015 1B Edwin Rios assigned to Ogden Raptors from AZL Dodgers. July 22, 2015 1B Edwin Rios assigned to AZL Dodgers. July 21, 2015 Los Angeles Dodgers signed 1B Edwin Rios.